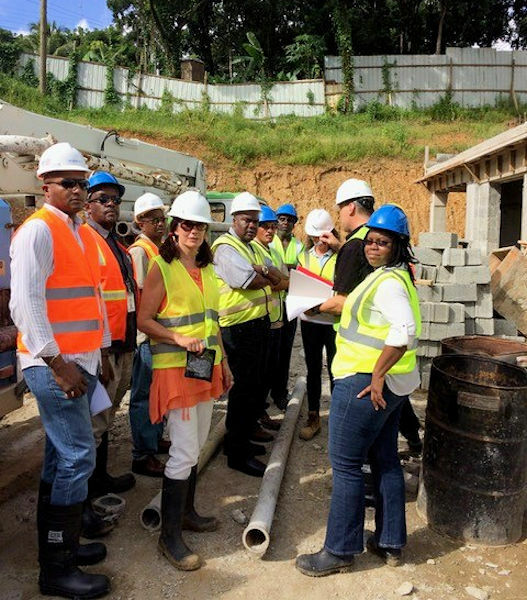 Valerie Jenkinson (fourth from left) participates in a water system capacity building meeting in St. Lucia as CEO of World Water and Wastewater Solutions Ltd. (Vancouver, British Columbia). She started Operators Without Borders to help the water sector in developing countries prepare for and respond to natural disasters. Photo courtesy of Jenkinson. When Valerie Jenkinson heard about the devastation in the small Caribbean nation of Dominica after Hurricane Maria, she was not content to just make a donation. She started an organization that will make a much larger and lasting difference: Operators Without Borders. Jenkinson knows the Caribbean area well since she spends about 6 month every year there conducting training as CEO of World Water and Wastewater Solutions Ltd. (Vancouver, British Columbia). “Over the years I have gotten to know a lot of people in the water industry in the Caribbean,” she said. She also attends water sector conferences in both Canada and the Caribbean. In September 2017, Hurricane Maria made landfall in Dominica. The category 5 storm decimated housing, infrastructure, and natural vegetation across the country. Jenkinson learned about the extent of the storm’s devastation as well as the country’s need for assistance during the Caribbean Water and Wastewater Association conference in Georgetown, Guyana. 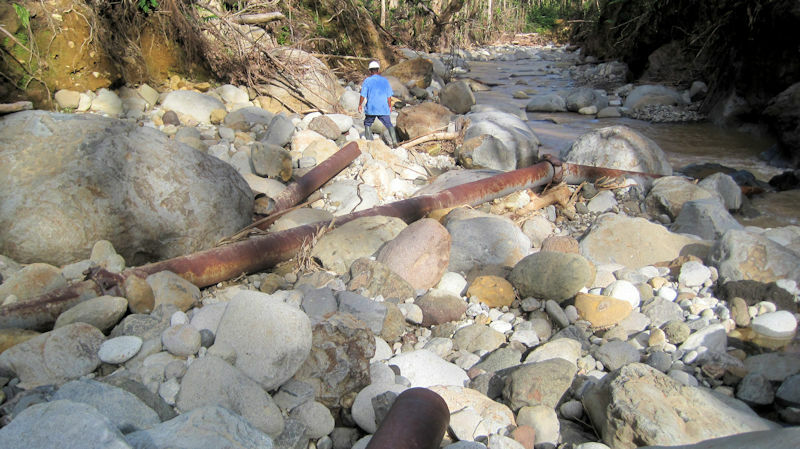 An old water distribution pipe that was damaged during Hurricane Maria lies on a river bed in Dominica. Photo courtesy of Marcel Misuraca, Ontario Clean Water Agency. Bernard Ettinoffe, general manager of Dominica Water and Sewerage Company Ltd. (Roseau), gave a keynote speech during the opening session at the conference. “He said, ‘we really need some help putting the systems back together,’” Jenkinson said. She met with Ettinoffe after the session and learned the devastation was so far-reaching that the country needed hands-on assistance and “boots on the ground” to get water and wastewater treatment services back up and running, she said. Team of operators will travel to help with disaster recovery and mentoring in developing countries through the new Operators Without Borders organization. Photo courtesy of Jenkinson. Jenkinson began spreading the message at water sector events, starting at the Canadian Water and Wastewater Association conference. She quickly began receiving donations from individuals and organizations as well as offers from numerous volunteers to help. 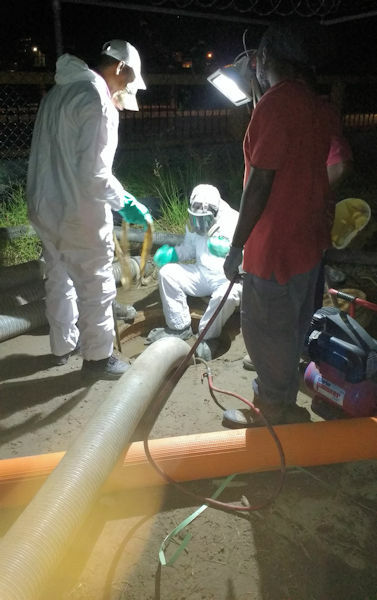 In December 2017, Jenkinson was able to send a team of three operators to help repair water and wastewater treatment systems in Dominica. 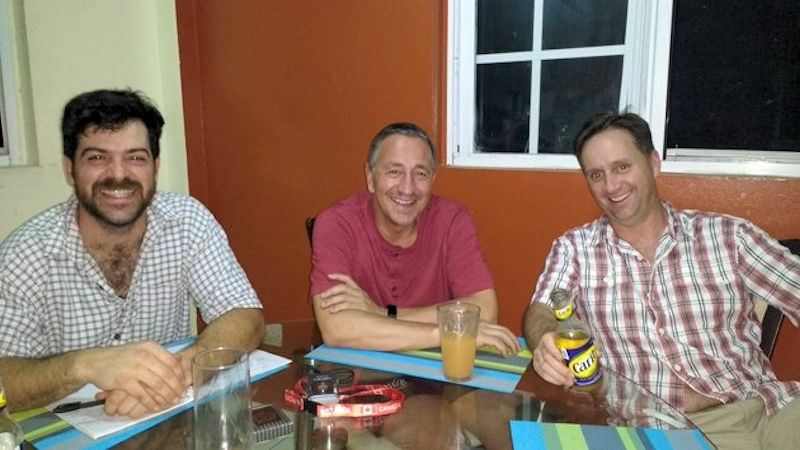 From left, Jason Mank and Marcel Misuraca, members of the OCWA Jets, and Glen Ketchum, another operator from Canada, spent 2 weeks repairing wastewater and water treatment infrastructure in Dominica. Photo courtesy of Misuraca. 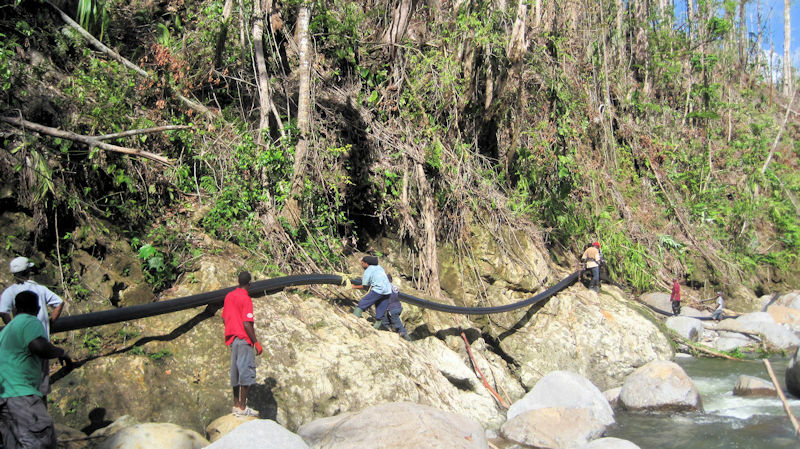 A new distribution pipe is being hung along the river during the first Operators Without Borders trip in December 2017. Photo courtesy of Misuraca. Mank and a local wastewater treatment system staff member prepare to enter a sewer during restoration efforts during the pilot Operators Without Borders trip. Photo courtesy of Misuraca. Thankfully, no major storms hit the Caribbean this past hurricane season, Jenkinson said. So, as she works to register Operators Without Borders as a nonprofit in Canada, she is expanding the scope of the organization. “There are other needs down there,” Jenkinson said. After brainstorming with some colleagues, Jenkinson has decided to start sending volunteers to mentor and train operators working throughout the Caribbean. Volunteers will work for 2 weeks alongside local crews in developing countries, learn their processes, assess their knowledge, and begin sharing information and tips to help local workers optimize processes, Jenkinson said. Two teams are scheduled to travel to Belize and Barbados in February. 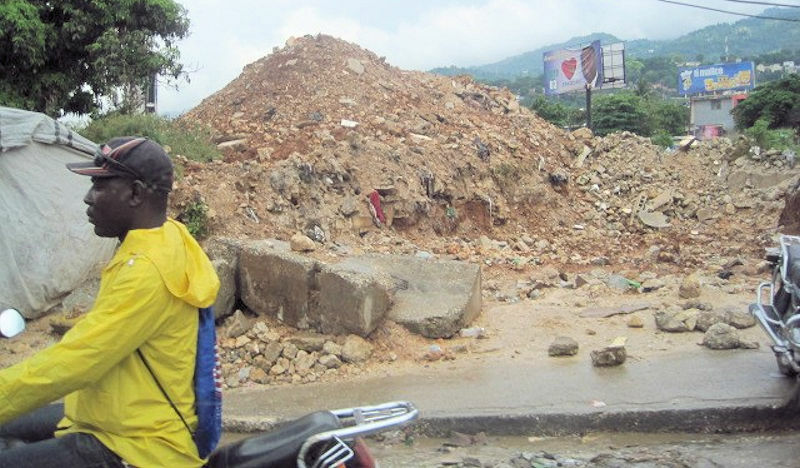 Jenkinson has seen natural disasters decimate infrastructure in countries such as Haiti after an earthquake hit in 2010. She hopes Operators Without Borders can send teams to help the water sector anywhere that needs them in the future. Photo courtesy of Jenkinson. Jenkinson stands with operators at a pumping station in Haiti. Operators Without Borders is an organization of “operators supporting operators,” she said. Photo courtesy of Jenkinson. Funds limit the number of teams that can be sent on disaster recovery and training trips, Jenkinson said. It costs between $1000 and $1500 to send each volunteer on the missions. But she is working to spread the word to other potential donors and volunteers by giving presentations at industry events and during training sessions. In addition to filing paperwork registering the organization as a charity, Jenkinson has pulled together a Board of Directors, created bylaws for the organization, and is creating a website and database of potential volunteers. Jenkinson always is looking for new volunteers, especially individuals with experience running desalination facilities as well as donors or partners. Those interested in contributing or learning more can contact her at jenkinsonv@gmail.com.